The Struve Geodetic Arc is a chain of survey triangulations stretching from Hammerfest in Norway to the Black Sea. The chain was established and used by the German-born Russian scientist Friedrich Georg Wilhelm von Struve in the years 1816 to 1855 to establish the exact size and shape of the earth. The area of the Arc designated as a WHS consists of 34 stations, spanning 10 countries and over 2,820 km. Originally there were 265 stations, in only 2 countries (the Russian Empire and the Union between Sweden & Norway). I am happy to finally be able to tick off this weird WHS, and present to you a trip report to another one of the measure points. I choose “Oravivuori”, located on the top of a hill some 30km south of Jyväskylä in Central Finland. A GPS or car navigation will stear you close using the provided coordinates. The site is also signposted well from the main road between Tampere and Jyväskylä, and you should follow these signs to reach the improvised parking lot at the foot of the hill. It’s better to turn off the car navigation for the final stretch, as at least my TomTom wanted to take me on a different (unpaved) route. The site lies 8 km from the main highway. The road is mostly half-paved, and unpaved for the last km. Access is not maintained in winter, and I also wouldn’t advise a visit during or just after heavy rains. From the car park a path leads uphill for one km to the top, where the measuring point is and also an observation tower. “One km” doesn’t sound far, but it is a steep climb on a narrow path. There are information boards at the start and along the way, as well as wooden benches to sit on every 250m. It surprised me how well-looked after it all is, as it isn’t a site where the casual tourist would show up. There’s an open area at the top of the hill, just enough forest is cleared to hold a stone marker and a large wooden observation tower. I am not really sure which one of the two marks the exact “Struve spot” however. At the foot of the observation tower I wrote my name in the provided log book. It seems that there are some 6 to 8 visitors to this site daily in summer. 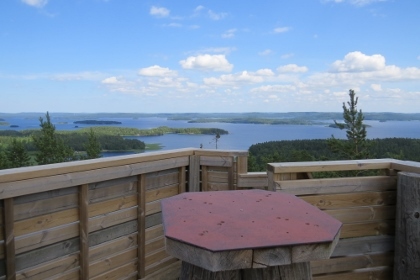 Of course I went up to the top of the tower too – it has good views over the quintessential Finnish landscape of thick forest dotted with lakes. My 2nd Struve site I visited during the WH meeting of 2016 in Lithuania. It's location #023, Meskonys. This one can be found in a field some 200m from a main road, and is signposted. There's nothing more to see than a manhole cover-like object, surrounded by a small white fence. There's an information panel about the Struve sites on your walk to the field. John Booth reviewed this location back in 2010 but, following our visit in Dec 2018, there are a few more aspects about it, and the Struve Arc as a whole, which I think are worth recording. This is the very furthest north location of the Arc and has been allocated reference number "001" by UNESCO. It certainly possesses a rather fine memorial (photo) and is, presumably, where the whole survey started? Well not really. The idea that Struve and his team went to a furthest point and “triangulated” their way South to the other end isn’t how it happened. The process leading to the inscribed continuously surveyed arc took around 40 years and didn’t even start with that objective in mind. 2 "Russians" (the former was born in Altona, then under Danish sovereignty, of a German speaking family which emigrated to Russia and he is usually characterised as "German Russian whilst the latter was born in present day Estonia!) - the Astronomer Prof Struve (1816) and Lt Gen C.F Tenner of the Russian army (1817) had started in different parts of W Russia for different reasons – the former in Livonia for largely scientific ones and the latter in Lithuania for military mapping purposes (this was soon after the Napoleonic wars and the military and Tsar Alexander I recognised the need for better maps of his country). By 1828 they started to work together and, around 1831, Tsar Nicholas I agreed to give a combined (but still Russian) exercise financial and personal support. In so doing he also took on board the scientific potential of the exercise as befitted a monarch who had “pretensions” even if he was disastrously “conservative” in the way he governed Russia. It wasn’t until 1844 that it was decided to extend north into Norway/Sweden and south into Bessarabia to create a complete “Barents to Black Sea” arc. It was only at this point that the exercise became “international” and an agreement was reached with Oscar I, king of Norway and Sweden. Whilst Tenner (who surveyed far more of the "Struve Arc" than Struve himself did!) progressed south to Ismael (now Staro-Nekrassowka) by 1848, the extension North was entirely in Scandinavian hands (with Sweden covering the southern area on the Swedish/Finnish frontier and Norway covering Finnmark). Fuglenes was first marked in 1846, with more detailed work taking until 1850. Interestingly the objective of reaching the Barents Sea at Nordkapp was never achieved – bad weather prevented one attempt. So Fuglenes was actually the LAST assigned measuring point. Starting from the South, Struve gave it his highest Triangulation Ref No 258 when documenting his results. If you ever find yourself in Hammerfest you can easily reach this most northerly outpost of the Meridian Arc! The tourist office on the harbour front offers a nice little flyer titled “Norwegian Points on the Struve Geodetic Arc” (Free – very unusual in Norway!!!). Contemporary Fuglenes is a suburb situated c 2.5kms round the harbour going North – a c35 mins +/- walk one way and rather icy underfoot when we did it in December. We were glad of the crampons on our shoes! If, as we were, you are travelling on the Hurtigruten ferry don’t even think of paying the outrageous price for a tour of Hammerfest Town (c NOK 900/ 95 EUR). For this you get - the town museum, the UNESCO site and “a spectacular view of the liquid natural gas (LNG) refinery”!! But, beware, if your ship arrives late, the scheduled 2 hours will be reduced by that amount so the return walk and viewing time could get tight. The “UNESCO WHS” information boards are inside a shelter situated below the small hill on which the memorial itself is located – in bad weather you could be pleased to make use of it! Above it you will see a surprisingly handsome memorial pillar with identical gold lettering inscriptions on opposite sides in Latin and Norwegian, topped by a copper globe. There are views out to the bay but the memorial is surrounded by buildings and a busy harbour. Our previous Struve visit (reviewed below) to Porlom II (Ref 1187-013) in Finland encountered only a modern wooden post with a contemporary board showing the UNESCO logo. Reviews of other locations describe equally “modern” marking of the survey point. However, its rather pompous grandeur and the use of Latin in the inscription, suggested that this monument was indeed from the Survey era! But the tourist office flyer gave no information about the memorial’s history. c. The monument was officially placed in location in October 1854.
d. Although Fuglenes got a pillar and globe as its monument, rather than the originally planned obelisk, the Nomination File contains a photo of the monument at Ismael (Staro-Nekrassowka) – and it is indeed an Obelisk (it is also described as having been built “in 1853-55 and renovated in 1994”)!!! The wording on it is exactly the same as that at Fugelnes, but this time in Latin and Cyrillic, referring to the 3 rulers i.e 2 Russian Tsars (Alexander I gets a mention, despite dying in 1824, as the process was regarded as lasting from 1816-52) and the King of Norway/Sweden. e. These 2 monuments at the extreme ends of the Arc are, apparently the ONLY 2 original monuments along it. I believe also that only 2 original buildings are the Observatory at Tartu and the Church at Torneå. Beyond that, the “original” features are limited to plates, rock markings and, holes (“The monumentation of the stations of the Struve Arc varied with different types of marks in different areas. In Finland many were marked on the solid rock by drilling a hole. The hole was filled with lead and on the top of the lead was a plate of brass. Nearly all stations between Hogland and Tornio were marked with small copper plates, which were soldered with lead into 3-6 cm deep holes drilled in the rock or big stones. In the course of time most of the plates have disappeared. In fact most of them were found missing already in the 1890s. Later the lead has been dug out, maybe to be made into shot for the hunters, but the holes have survived in most of Finnish points”). The full article shows a photo of the Monument dated 1882. But there is more of interest! 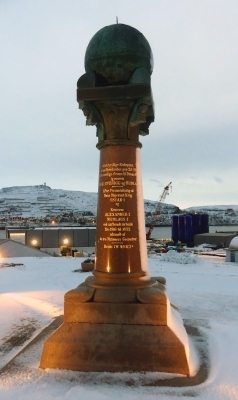 What happened to the monument during WWII when Hammerfest was both bombed by the allies and left in ruins by the Nazi “scorched earth” retreat strategy? It appears that the monument had first been divided into pieces (globe, capital, pillar and foot) and stored in the hospital basement for safety. But, during Hammerfest’s total evacuation and destruction in Oct 1944, it must have been moved by the Germans and the parts were found after the war in Trondheim!!! (Hammerfest was occupied by Soviet forces). Some repairs were necessary ("Damaged during WWII"?) and it wasn’t until May 17 1949 that it was returned to its correct location. But it had one more hurdle to overcome - around 1986 “The municipality wanted to move the meridian monument from its existing place on Fuglenes and out to Skansen…but such move plans were stopped under the Signal Act and later also the Cultural Protection Act. 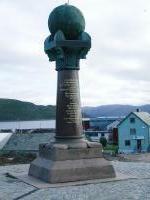 When it became apparent that Struve's meridian arc could enter UNESCO's World Heritage Site, Hammerfest municipality (carried out) considerable work to excel in the area around the meridian pillar…… For today, the meridian support in Hammerfest is characterized as the finest the monument on Struve’s meridian arc, and Hammerfest municipality have made a great effort to get a beautiful area around (it).”!! The requested "move" was undoubtedly intended to facilitate development of the site - the buildings still come to within around 20m -which would have "done for" any possibility of inscription. A "lucky" escape since the Nomination File goes into some detail to demonstrate the authenticity/integrity of such physical remains as do exist with that factor being important regarding the choice of the 34 locations from among the original 258 main points. Apparently the removal of the pillar in WWII didn’t “lose” the original “base” markings and the location it was returned to is regarded as fully “authentic! So, my personal “Struve Quotient” now stands at 2/34 (with 1 more “deliberately” missed - see my earlier review) across 2 out of 10 countries. Do I “need” more? There is I guess a certain perverse pleasure (even excitement?) to be gained from reaching esoteric locations in far away fields and forests but I am happy that I have “done” Struve now! My only exception might be if I were ever to find myself within reach of Staro-Nekrassowka, where it might be nice, for the sake of “completeness”, to have reached both ends - rather as we have done for the Great Wall. The addition of Fugelnes has undoubtedly “added value” to our earlier visit to Porlom II. It was good to see an original memorial in its “snow blasted” glory close to the “ends of the Earth” (sorry Hammerfest!) - but the benefit perhaps arose more from the extra research which the visit stimulated than from the visit itself. The Struve Arc isn’t really a WHS for “visiting” but more a WHS for “understanding”. Indeed I regard its tangible OUV as somewhat marginal. As a map lover I understand the argument for a WHS to represent the strides made in surveying and representing the Earth, but the Struve Arc can best be regarded as a “representative” for the history of Surveying alongside its several sibling contemporaries rather than as the unique “pinnacle of achievement” which the WHS nomination system unfortunately requires to be argued. a. It is often represented as proving, as predicted by Newton, that the earth is flattened at the poles – but this had already been established by 18th C French expeditions to Ecuador and “Lapland” (Indeed the Finnish portion of Struve utilised some of the latter’s trig points) – see. The main achievement of Struve was to calculate this “flatness” more accurately. b. The Nomination File makes much of the international credentials of the exercise “It was the first meridian arc measurement to cross multiple international boundaries”. Well only 2 actually and the second one was only “semi-international” - Russia/Sweden and Sweden/Norway! c. The Nomination also emphasises Struve’s primacy in length – 2820kms versus the North/South maximum achieved by the Trigonometric Survey of India at 2364kms - which is also dismissed as being in only one country – “India”. This rather underplays the complexity of that landmass in terms of independent states long before Independence. It also underplays the total length of both East/West and North/South sections surveyed in India in very difficult circumstances. My research has identified some further aspects/issues which might be of interest to those WH travellers who “enjoy” background aspects of inscribed sites! a. 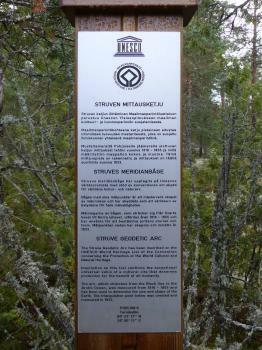 The process to get the Struve Arc inscribed was first initiated at an international scientific conference in 1993 – “the paper was presented….. by ….the National Land Survey of Finland who included mention of Veriö’s idea for seeking a UNESCO declaration to preserve a selection of the remaining points of the Struve Arc as a World Heritage site” . (Thus explaining why Finland became leader on the proposal). This paper provides a history of its nomination. b. Note that the subsequent proposal mentioned 10 potentially "participating" countries including Poland (incorrectly!!) and missed out Russia altogether!! In fact, despite its original paramount role in creating the Struve Arc, Russia, ironically, only has 2 points lying within its contemporary boundaries!! These are on the island of Gogland (Hogland) in the Gulf of Bothnia. This, until 1831, had been Struve's nothernmost point since it lay within "Russia proper" (having been captured from Sweden by Peter the Great in 1713). Later it was transferred to the Duchy of Finland and became a part of independent Finland in 1917. It was captured by USSR during the Winter War, recaptured by Finland in 1942, rebuffed the Nazis in 1944 and was finally ceded back to USSR at the end of WWII - thus giving Russia its only 2 "Struve points"! c. The AB evaluation contains the comment “An extension of this nomination, to include the arc connecting it with South Africa, should be considered in future”. This paper provides the background and rationale. And it appears that work to do so has indeed been progressing! See this paper from 2016. My personal view would be that the Struve Arc adequately covers the subject and that the Surveyors should quit whilst they are ahead!! I had finally made it. After always ignoring this WHS due to the distances involved in getting to any or the lack of interest to actually go out of the way to see a monument I would drive along the road in Belarus to see a Cyrillic UNESCO World Heritage sign on the side: Leskovichi Ivanovo. I had obviously added this to my list of places to visit knowing it was so easy to attach to the itinerary. There is even a bus stop here in the middle of nowhere!! You don't have to go far to see the marker, 5 meters off the road. 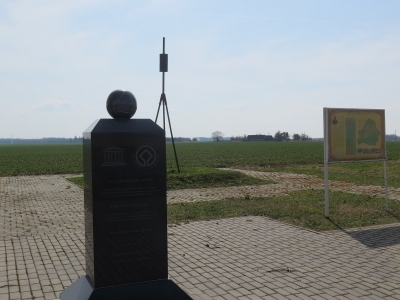 Behind the Struve monument is an old device used for measuring plus a sign post to explain the arc, it's importance and history in English as well. Overall I was satisfied and spent a good 15 minutes reading, taking pictures and doing a quick Wikipedia read plus the sun was out in early April. I suppose I don't recommend visiting unless you are into science or history, or both, but this was so convenient I couldn't dismiss it. This was the most satisfying UNESCO site to date, which seems crazy to me. Getting there from Chisinau was pretty easy. A driver took me (about 3hrs each way). Cost about 50 euros total for the taxi. We also stopped at the Rudy Monastery nearby. 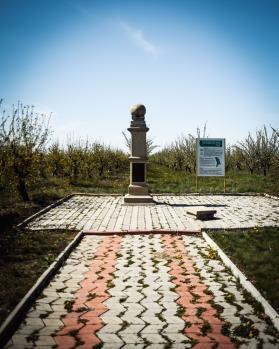 The monument is in the middle of an Apple Orchard. No one at my hotel in Chisinau, my taxi driver, or anyone at the monastery knew about the Struve point or where it was. However, a local farmer knew how to get to the point. There's actually a sign off the highway, but it's not clearly visible. Using the gps points didn't work. Like other Struve points, there's not much to see. However, I felt euphoric afterwards. Read more about my Unesco World Heritage travels on my website. After seeing several Struve monuments or geodetic points in Norway, Lithuania and Latvia (there are several points which have not been inscribed! ), I made an effort to get a better understanding of this WHS by visiting the old Tartu Observatory in Estonia in September 2016. Some pointers to keep in mind if you intend to visit: opening hours are Tuesday to Sunday 10:00 to 18:00 and if your very keen and have enough time you can also try your luck by booking at least 3 days in advance for a night visit including an observation from the old observatory’s main telescope, a Carl Zeiss Refractor from 1911. The old observatory is situated in the middle of Tartu on a hill full of trees. This means you'll most likely not be able to see it while driving around in circles to find a parking spot. There are stairs leading up to the observatory from different points around the hill. Make sure to bring a mosquito repellent in summer, you won't regret it. There is a Struve Monument just in front of the old observatory and a metal sheet/Unesco plaque just next to the entrance. Once you enter the old observatory, make sure to look where you're standing while paying the entrance ticket. Most probably you'll be standing on the observatory's Struve Geodetic point, the first point of the geodetic arc (centre of my photo collage). Next to the point, there is an information board on Struve and a huge one storey map showing the geodetic points. 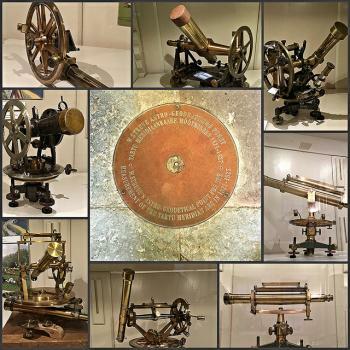 Although the old observatory interior is mainly geared towards astronomy, there is a special cabinet with several Struve instruments used for the geodetic arc (photo). Finally I could try to understand and appreciate why most of the sites in this transnational inscription had a small point. These instruments were placed on top of this metal point and all sorts of complex mathemical measurements and calculations were made (although I guess the manhole cover in Meskonys, Lithuania was added afterwards!). From the top of the observatory I could see some of the steeples of Tartu but not much because of the tall trees. To celebrate my visit I bought a 1000 piece UNESCO puzzle of the geodetic struve points as well as a very good book on the Struve geodetic arc and the different instruments displayed in the old Tartu observatory. This is definitely one of the strangest WHS on the list but if you manage to fit in a visit to the old Tartu observatory you will get more out of this weird inscription and in my opinion you can safely tick this one off the list. If you're still unimpressed, head to a fine nearby cafe/restaurant called Vilde (Wilde) Health Cafe for a superb dinner and a pint of A. Le Coq! With the Struve Arc being “in the news” on this site because of the 2016 “WHS Travellers Meeting” visit there, it seems a good time to add a review of another location which, as far as I can see, hasn’t previously been reviewed here - UNESCO Ref 1187-013 Porlom II in Finland which was visited by us in Aug 2016. The site is very conveniently situated about half way between Helsinki and the WHS of Verla Board Mill - a visit to it by car from Helsinki will still get you to Verla in time for lunch. At around 115kms out of Helsinki, turn north off route 6 along 1771 (The WHS is not signed at this turn off). 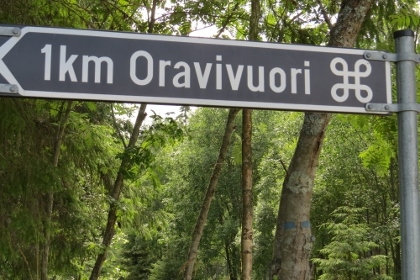 After 10kms you will reach the village of Porlammi. There, take 1751 north for a few kms and you will see a sign to the WHS pointing right (north) along a dirt road which leads to a beach (In Finnish = “Uimaranta”) on the nearby Lake Pyhäjärvi (apparently, there are 39 lakes in Finland named “Pyhäjärvi” which means “Holy Lake” so, if you are using map software, be sure you get the right one!). There are no more signs along a road which has a fair number of junctions - you just have to navigate on dead reckoning north towards the lake following the most “used” tracks! If you reach the shore you have gone about 300 metres too far. Set back from the road in light undergrowth to the left as you come from Porlammi there is a sign with a full description of the Arc with maps etc and an indication that the “holy grail” is a, pleasingly exact, 420m away! 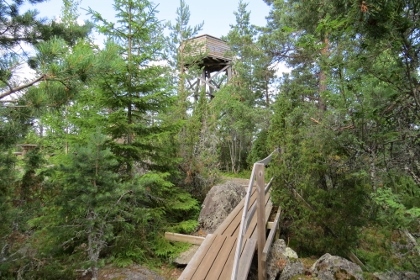 From there a footpath climbs slightly through the forest, carpeted with reindeer moss and plants heavy with berries. You will arrive at a bald rock overlooking the lake and, behind you, will be the object of your journey - the actual marker which is set on a wooden post with a possibly significant “line” cut vertically into it implying that it has been located to the accuracy of a centimetre!! The first notice board states that “it was measured in 1833 by marking the point in the rock with a drill” but I could see no drill hole and the marker wobbled disconcertingly in its setting when pushed – so, how accurately the marker has really been placed is anyone’s guess. An interesting fact on the first notice board is that, at the time of Struve, this area was free of trees – this was important of course to provide 360 degree sight lines for the triangulation measurements. Today you can only look north across the lake. 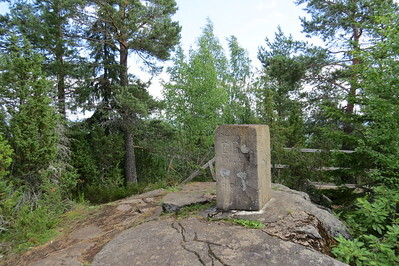 Another fact mentioned on the notice board is that, in 1922, a re-measure took place and the Finnish Geodetic Institute placed its triangulation point 64.6m away. This was in use until the 1980s when satellite based measurements started. But we could see no signs directing us towards this second point. We were, by the way, the only visitors on this August Wednesday morning. Which brings us to the “photo of record” for the site! I thought of using one of me looking “triumphant” whilst clutching the marker post (or one of Mrs Solivagent looking distinctly unimpressed) but that would break my "rule" of not using personal “snaps” so it has to be just the marker and a few moss covered bushes! 4 days later on our trip around Finland we were driving round the Gulf of Bothnia from Lulea/Gammelstad (Yes, I know they are in Sweden but Gammelstad was only around 800kms return additional to our Finnish route so we could hardly miss it!) with the aim of getting within 200kms of Rauma that evening - a journey of c650kms. At Tornio, on the Finnish/Swedish border we passed the sign showing that we were within 3 kms of the church which is the location for Struve Arc Ref 1187-11 and I had to ask myself whether I was a prisoner of an obsession or a man of free will!! Where would the “value add” have been? It wasn’t even as if the site hadn’t been reviewed here? I resolved my dilemma by convincing myself to “trade” a visit to another Struve location for a visit to the Finnish T List site of “The large Stone age ruin of Giants Castle at Pattijoki” – near Raahe and still 200kms south. Was I wrong? Joking apart, I suppose anyone interested in WHS has to visit at least one of the Struve locations but they do seem to represent the “reductio ad absurdum” of the scheme whereby most of the locations have nothing present which needs “preserving” and those that do (like Tornio Church) are only of importance for purely associative reasons. Four years since my last visit. Three weeks of internet research. One aborted attempt to visit from a more logical place on the map. One surprise sign post pointing us in the right direction. 6 km of off road rallying. One creative bit of parking to accommodate another car heading in the other direction down the country lane. 600m of scrabbling over rocks through the forest. Mrs Cade wasn't quite as enthusiastic. Belarus has 5 sites related to Struve. 3 of them are located quite close to Ivanava (Polish name Janów Poleski) in the southern part of Belarus. Easily to see if you have your own transport. On the main road Brest - Pinsk there are no signs of the site. From Janów take road H472 to Motol (Motal). From there turn right to Osownica (Asaunica). Struve point is located on the top of the hill (south-eastern part of the village). Next point is in the forest close to Szczekuck (Szczakock) - road Motol - Janów, there is a sign of Struve, the point located some 500 meters from the road. The last point is completely unmarked located on the hill (in the middle of corn fields) close to the village of Laskawiczy (no road nor path to get there). 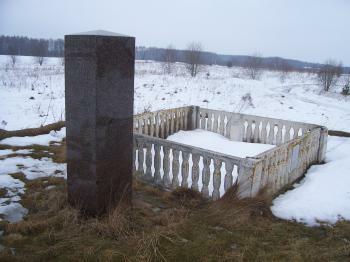 Simuna and Voivere, Estonia - an obelisk in Simuna and an underground stone at Voivere, both sites accessible by bus from Rakvere. 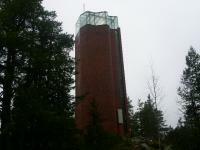 Tartu, Estonia - the observatory, on a hill overlooking the town, is closed on Mondays and Tuesdays. There is a memorial to Struve nearby. The site is accessible from Tallinn by bus and train. 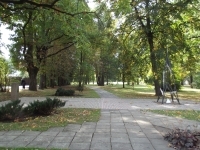 Jekabpils, Latvia - the site is located in Struve Park on Struve Street, close to the Daugava River. The town is accessible by bus from Riga. If you want to choose one point to visit Struve Geodetic Arc the best place is probably the Tartu old observatory. The observatory is located on a hill next to the town centre. Inside of a observatory there was small exhibition about astronomy and 2 very helpful ladies who told about the history of observatory and the geodetic arc. There was big map of the Struve arc and some brochures and sign saying it's world heritage site. Otherwise Tartu is very lovely town, worth of day trip from Tallinn for example. There's buses (and slow train) going all the time between the cities. 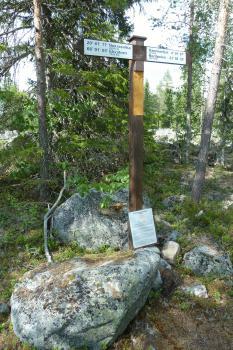 I have also visited the Aavasaksa point of arc in Finnish Lapland long time ago. It's right next to the road between Tornio and Kilpisjärvi and good place to stop on your way to north and see the beautiful views to Tornio River valley. Sturve Geodetic Arc is a very stange multi-location site. Each location is quite small, some corresponding to a 100 meter diametre circle centered on a traingulation point. Those points may consist just of a small mark on a stone. I visited 3 of those sites in June 2009. The first went to Tornea church in Finland. A simple church typical of that area, from which tower Sturve made a triangulation point. Easy to find in an otherwise unremarkable Finnish border town. The second point I visited was Peera-Vaara in Sweden. It is a point atop a flat hill, which is supposed to be the highest point in the area. It is difficult to find. It is closed to the village of Hedenäset. The dirt road going to the point is not marked, and I was lucky to have printed the map included in the nomination file to find my way. Follow a dirt road going on the left from road 398 from the village. After 10 minutes turn right uphill, and after a few minutes, there is a small parking spot (place for 2 cars only). From there, 10 minutes walk on a wooded path. You then reach a mark on a stone with a wooden sign above it. It is in the middle of the forest (hence no view). This place is only for the World Heritage collectors, even if the forest walk is quite nice. The third point is luckily much easier to find ; Avasaksa is a nice hill, which top can be reached by car. The exact location of the site seems to be the big observation tower. The view in the area is quite nice on the river that marks the border between Finland and Sweden. So far I have only visited several site on the arc in Scandinavia, although like Ian I fear there may be more in the future. I reached the Alatornio Church by travelling from Kemi station by bus to Tornio, a town located on an island in the Tornio River. The church with its distinctive clock tower is on another island further south and facing the Swedish town of Haparanda on the opposite bank. The short way to the church is by crossing a footbridge back to the Finnish shore, going south, then crossing the railway bridge linking Sweden and Finland, with its dual gauge tracks. This brought me to the cemetery at the back of the church. On the bus journey through Lapland from Rovaniemi to Alta I stopped in Enontekio and Kautokino, but didn't locate the Struve markers in either place or in Alta. But I did visit the Struve obelisk on the Fuglenaes Peninsular near Hammerfest. Although it is in a fairly industrial part of town my only companions were a herd of reindeer grazing on the newly planted lawn. Hammerfest, on an island connected by bridge and tunnel to the Norwegian mainland, is the end of the line for a bus service from Alta. I was amazed to find here at latitude 70 deg N that there is a city, factories, grass and animals. I had previously been at latitude 70 deg S (Antarctic Peninsular) where there are only rocks, ice and penguins. At some stage this interest in World Heritage Sites turned from an awareness of major tourist sites into a full blown obsession. This was perhaps best illustrated by the fact I found myself alone in a field a few km off of the Vilnius- Minsk highway on a particularly chilly Saturday morning. The measuring post I visited was at Beresnäki about 18km from Vilnius. It is essentially a slab of concrete with a small concrete fence around it. Next to this is a small obelisk marking its inscription on the World Heritage List. There was also an information board. Aside from that there was nothing else in the field. I walked about 3km to get to the field from a local bus stop. There were a few houses on this route and two locals stopped me to ask where I was going, unfortunately I hadn’t learnt “I’m going to look at a geodetic measuring post in a field up ahead” in Lithuania by this point, and probably never will. Despite being so close to the capital this area did feel particularly rural. You won’t be surprised to find out that mine were the only set of footprints in the snow that led up to the site. Altogether it took me about 1h45mins to visit this site including about 5 minutes at the site taking photos and doing a few laps. I’m now left in a quandary about when to count the Struve Geodetic Arc as a visited site. I have certainly put less effort into seeing other inscribed sites however I have seen only one of the 34 inscribed sites which stretch over a mammoth 2830km. I think I may leave the ‘ticking off’ of this site until I have seen a post in a different country or visited the Observatory at Tartu. If anyone else is also stupid enough to want to visit this site by public transport then Bus 16 from Vilnius can drop you off at Posukus from where it is a 3 km walk. Alternatively the bus company Romeksas run buses to Rukainiai and this will drop you off a little closer at the turn off to the site which is marked with the words Struves Geodezinis Punktas 1 but I have no idea of any kind schedule for them. There is another inscribed post about 2km north or the geographical centre of Europe about 20km north of Vilnius. It would be very easy to get to these points with your own car and a GPS as for once you really can rely on the co-ordinates that UNESCO provide. All in all was it worth it? Well for me yes it was, as I have another little story to tell of some esoteric travelling, and I had plenty of time to enjoy the other delights of Vilnius. Would I recommend it to anyone else? Probably not unless you are equally as obsessed with this little list that UNESCO has. Will I visit more posts in different parts of Eastern Europe? Sadly I'm pretty certain I will. I've been to four sites(Alatornio kirko,Aavasaksa,Dorpat observatory and JACOBSTADT point). It's scientific interest,but almost sites are difficult to get. 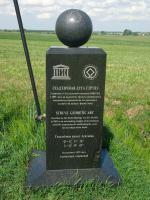 Thus the more these are difficult to get,the more emotional when found.Struve Geodetic Arc is so. When I've been to the Dorpat Observatory in Tartu,Estonia,it isn't open for public. But the workers to restore the architecture allowed me to see inside and climb the ladder up to the top so that I could see over the view of city of Tartu. Mathematical Concepts: Triangulation. Triangulation is the process of determining the location of a point by forming triangles to it from known points, especifically by measuring the angles of the formed triangle. Struve used this approach to measure the meridian and oblateness of the earth by measuring the angles formed of the geodetic points. Baltic Sea: Svartivara Island (Finland) Mäkipällys and Ponit Z on Hogland Island (Russia). All three on island in the Baltic See. Been part of independent Finland (de facto): Mäki-Päälys, Hogland Z: The island of Gogland or Suursaari in Finnish, Högland in Swedish, was a part of Finland until 1939 when Soviet Union occupied it. Finnish army took it back in 1941 but Soviet Union occupied it definitively in 1942. 151 Community Members have visited.